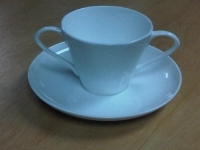 This item is a beautifully and elegantly designed two handled tea cup. It's been made from fine bone china and looks and provides a touch of class wherever it is used. The two handled cup makes for a secure grip that in turn makes the cup easier to handle - which itself lends to increasing confidence in users - particularly those who suffer from tremors, or with reduced strength in their hands. The handles are designed to offer a variety of alternative holding positions to enable a choice of grip which best suits the user.